We are pleased to announce the Wharton Global Alumni Forum Raffle and Auction in Hong Kong on May 25-26, 2007. A raffle is a game of chance, in which contestants purchase tickets which give them opportunities to win excellent prizes. Winners are determined by the chance event that their raffle tickets are drawn. The only actions required by the contestants are to purchase the raffle tickets and to be present at the dinner on Saturday, May 26th, when the prize-winning tickets will be drawn. Starting on Friday, May 25th, all participants in the Forum will have the opportunity to purchase as many tickets as desired at a price of HK$100 (or equivalent in other currencies) each. The more tickets you purchase, the greater your chances of winning one of the prizes. You will be able to purchase tickets at any time between Friday and Saturday evening. On Saturday evening, the winners will be drawn and announced immediately. An auction also offers participants an opportunity to acquire excellent prizes. However, in the case of the auction, the participants will bid live for the prizes at the dinner on Saturday, May 26th. The highest bidder for each of the three items listed below will win. Each prize has a starting, or minimum, bid, as indicated below. In keeping with the tradition of the Forum Raffle, the proceeds of the sale of tickets will be donated to a charity. This year, the beneficiary of the Hong Kong raffle will be “Save China’s Tigers”, an organization founded by Li Quan, WG’89, which works to prevent the extinction of China’s tigers. To learn more about this worthy organization, please visit its website at http://www.savechinastigers.org. One Original Painting by Artist Lorette Roberts for Save China's Tigers' childrens' book-"Tang the Tiger Cub"
Please keep checking the website as more excellent prizes are added! It's one of a limited edition of 99 pieces of “Tribute to South China Tiger" Limited Edition Ring Handmade by Dickson Yewn. Each one is different and distinct like the tiger, starting with a serial number of 333001 to 333099. The"99" means forever forever and the "333" means alive alive and alive! Long Live the South China Tiger! Handmade Black & White Diamonds Ring in 18 Karat Rose and Yellow Gold. Chinese tiger frozen in motion. Time holding its breath. The painting has to have the power to capture this moment. It is that what I am after.To capture that moment for eternity. This painting is an example of the artist’s work; the actual auction painting has been commissioned and will be available for inspection at the Forum. Painting of a South China Tiger. Laohu Valley Reserve is established by Stuart Bray and Li Quan, both Wharton ’89, for the purposes of Rewilding the South China Tigers. It spans 33000 hectares with South Africa’s largest river-the Orange River flowing in between. The Reserve and its luxurious Villa TigerLi are not open to the public and reserved only for Save China’s Tigers’ donors and volunteers, who are not only able to gain a privileged view of the behind-the-scene tiger rewilding operation with SCT’s staff, but also taken on game drives to view indigenous wildlife, as well as an exclusive boat ride through the stunningly beautiful Orange River. 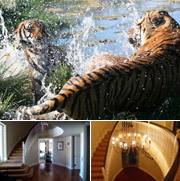 Villa TigerLi can accommodate between 8 to 10 people (one “Honeymoon” Suite can sleep 4). Stuart & Li’s Cape Town seaside penthouse is situated in the center of Cape Town, 3 minute drive from the Victoria and Water Front, and has 270 degree views of the sea and the mountain. It has 6000 square feet and can sleep eight people in its four suites. Valid until end February 2008; exact dates to be arranged with owners. Airfares to and from South Africa and within South Africa are not included. Three Nights at Villa TigerLi at Laohu Valley Reserve with five nights at Penthouse Apartment in Cape Town of South Africa. Starting Bid: HK$888888. Ms. Jane Simons at movchan@wharton.upenn.edu.